I offer private lessons using the Wilson Language System. This is a multisensory structured language approach useful for children and adults who have been unable to learn to read in the classroom with other methods of reading and spelling. Based the Orton-Gillingham method developed by Anna Gillingham and Bessie Stillman, this type of teaching has been used successfully for over 50 years. Students are systematically taught the individual sounds of the language and then the total construction of words. This step-by-step method is geared for success. 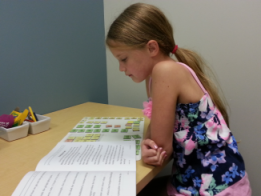 The students gain a complete understanding of word attack skills for both reading and spelling. I also have a number of students who experience handwriting difficulties due to dysgraphia who have benefitted from my tutoring, using Handwriting Without Tears®. Please contact me for information on available dates and times as well as fees for tutoring.